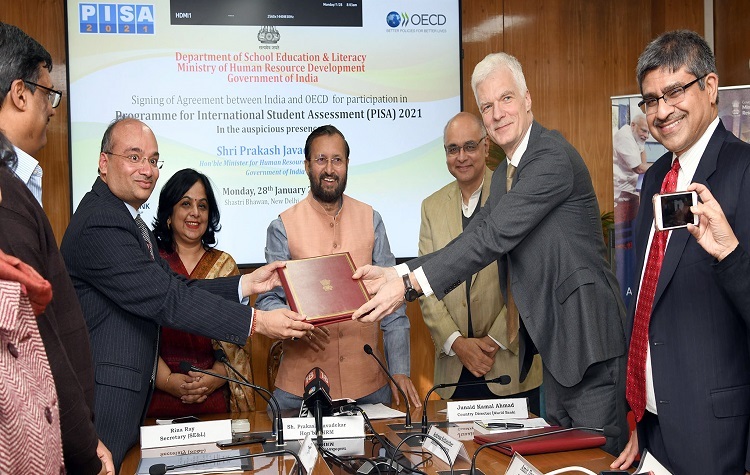 India and OECD today signed an agreement for India’s participation in Programme for International Student Assessment (PISA) 2021. The agreement was signed in presence of HRD minister Prakash Javadekar. While addressing the gathering, Javadekar said that the government has decided that India would participate in the Programme for International Students Assessment (PISA) to be conducted by the Organization for Economic Cooperation and Development (OECD) in 2021. He said that the participation in PISA 2021 would indicate the health of the education system and would motivate other schools/ states in the subsequent cycles. This will lead to improvement in the learning levels of children and enhance the quality of education in the country. He also informed that OECD has agreed to ask some of the questions based on Indian context. The minister hoped that students would perform well and India would get a good position in the overall rankings. Schools run by Kendriya Vidyalaya Sangathan (KVS), Navodaya Vidyalaya Samiti (NVS) and schools in the UT of Chandigarh will participate. Within the country (or specific geography to be covered in case of large countries), PISA covers a sample of 15-year-old students representing all forms of schooling, that is, public, private, private aided etc. PISA is a competency based assessment which unlike content-based assessment, measures the extent to which students have acquired key competencies that are essential for full participation in modern societies. It would lead to recognition and acceptability of Indian students and prepare them for the global economy in the 21st century. Learnings from participation in PISA will help to introduce competency based examination reforms in the school system and help move away from rote learning. The CBSE and NCERT will be part of the process and activities leading to the actual test. More than 80 countries, including 44 middle-income countries, have participated in the assessment since the first round of testing in 2000. Next round of PISA is going to be held in 2021. The list of registered countries includes Brazil, China (certain areas like Shanghai and Beijing) and countries from South-East Asia like Thailand, Indonesia, Malaysia and Vietnam. PISA is a triennial international survey (every three years) which aims to evaluate the education system worldwide by testing the skills and knowledge of 15-year-old students. Students are assessed in reading, mathematics, science and collaborative problem-solving. Participation in PISA allows benchmarking performance against a wide range of countries. PISA uses test items aligned with international benchmarks. Test items are adapted to the local context and language, pilot tested and validated before being used for the test. OECD has agreed to contextualise the questions for Indian students. Dear Parents! Are marks more important to you than your children?